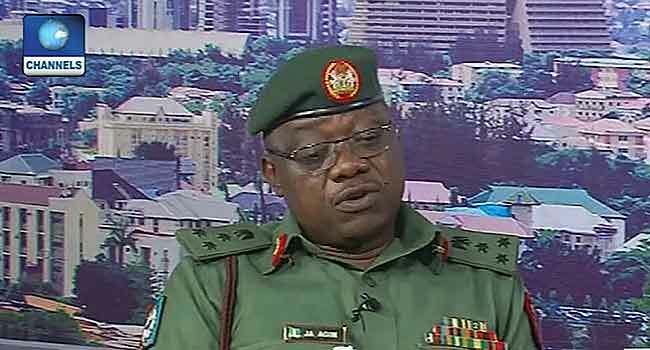 Defence Spokesperson, Brigadier General John Agim. The Nigeria military on Friday said it doesn’t have enough workforce to have a huge security presence in all Nigerian schools. Defence Spokesperson, Brigadier General John Agim, who was a guest on Channels Television Breakfast Programme, Sunrise Daily said due to the huge land mass, especially in the Northern East which is volatile to attacks, it is difficult to deploy troops to schools. “The military doesn’t have the manpower to deploy (troops) to all the schools. It is not possible. Agim, who lauded efforts of the Federal government which has authorised civil defence and the police officers to secure schools in Northeast Nigeria, emphasised that the military cannot deploy to schools like some people are demanding. “It is very difficult. It is not possible,” he said. The Defence Spokesperson also blamed this lack of sufficient man capacity on the abduction of over 110 schoolgirls in Government Girls Science and Technical College (GGSTC), Dapchi, Yobe State. Explaining the role, which the military played in securing Northeast, Agim said the military wasn’t negligent as being rumoured but the troops were redeployed for other assignments few weeks before the terrorists, unfortunately, invaded the school in Dapchi. “Where the military was deployed in Dapchi, they (the troops) were taken away. They were deployed for other assignments. So, it is possible that the Boko Haram can operate in a place for a long time without the military presence. “They were withdrawn out of Dapchi for another assignment on January 10 and this attack took place on February 19,” he said. Dapchi, a remote town in Yobe State was a safe haven before the abduction of 100 schoolgirls in GGSTC. Although a sizeable number of schoolgirls have been returned, Nigerians are still left in shock over the attack, wondering which school or pupils will be the next target by the terrorists.